Welcome to the Official Liverpool Supporters Club Fundraising Challenge 2018/19! Being part of Liverpool Football Club means being part of the greatest football family in the world. We look out for each other, and particularly those in need. The LFC Foundation is the official charity of Liverpool Football Club. Our mission is to bring together the LFC family to create life changing opportunities for children and young people in the Liverpool City Region and beyond. Last season, through the Fundraising Challenge, our OLSCs raised an amazing £16,778 to help support children and young people in need – and with your help together we can raise even more this year! To participate in the OLSC Fundraising Challenge, you must be recognised as an Official Liverpool FC Supporters Club (OLSC). If you are an OLSC and are interested in taking part, all information can be found on the Supporters Club Extranet. If you are a Member of a Supporters Club and want to know how to get involved, please contact your local Supporters Club for further information. Check out the video below capturing the experiences of our 2017/18 winners! This could be your OLSC! 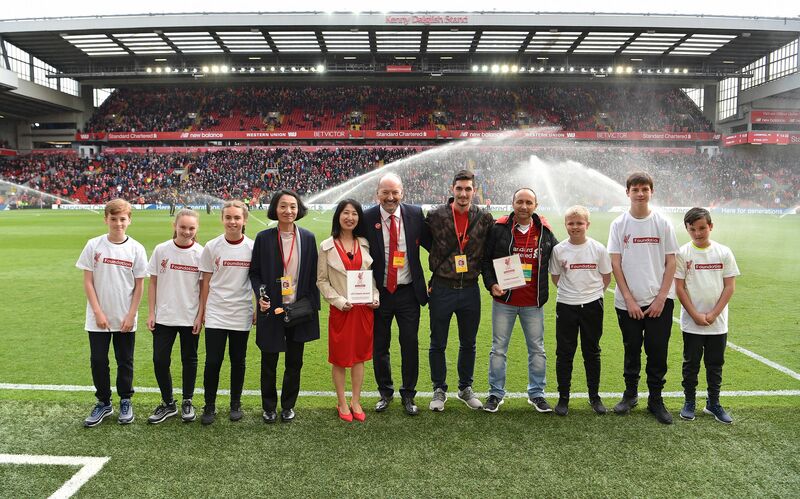 OLSC Cyprus & OLSC Japan, winners of the YNWA Award and LFC Family Award! There are 3 Fundraising Awards up for grabs in this season’s LFC Foundation OLSC Fundraising Challenge. The winners of each Award will receive a unique, once-in-a-lifetime LFC experience as a prize! Winners of each award will be announced after the competition ends, in June 2019. This is awarded to the OLSC who can raise the highest total fundraising amount during the challenge. This will be chosen after the fundraising total amounts are tallied up from each OLSC who had entered the competition. This is awarded to the OLSC who have created the most innovative fundraising ideas and activities. This is awarded to the OLSC who can deliver the most family-focused fundraising activity. The Winners of the Original Award and LFC Family Awards are chosen by a group of independent LFC representatives. The most innovative fundraiser will receive a Skype meet and greet with a First team player live from Melwood! The Supporters Club that chooses the most family focused activity you will win a VIP match day trip experience to LFC for two people and be presented a prize at the game! The Supporters Club that raises the most money will win a VIP match day trip experience to LFC for two people and be presented a prize at the game! 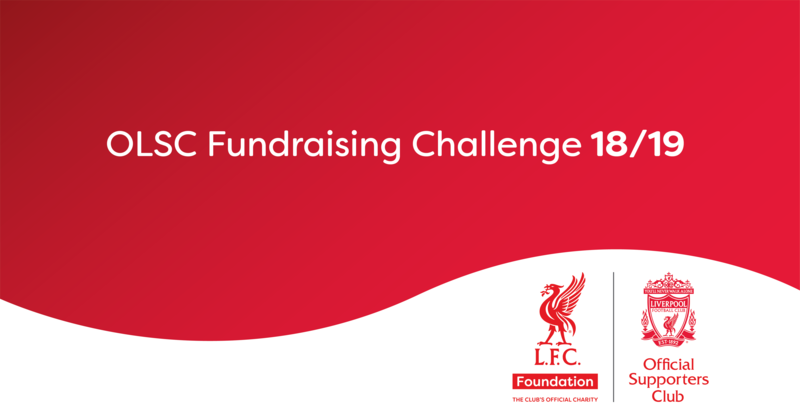 The LFC Foundation OLSC 2018/19 Fundraising Challenge ‘Fundraising Rewards’ are split into 5 Unique Levels, categorised in ascending order by the amount raised (in GBP) by OLSC’s, during the period of when the Challenge is live (between dates October 3rd 2018 and Sunday 12th May 2019). With each Level, there is the chance for OLSC ‘s (who have raised the fundraising amount requirements for that Level) to win limited LFC Prizes. This is through five ‘Prize Draws’ (1 Draw per Level) that are drawn at the end of the Challenge in June 2019. Winners are selected by random through a ‘Random Pick Draw’ and continue to be selected until the limited amount of LFC Prizes per level are allocated. Liverpool FC 2018/19 Home Shirt signed by Liverpool FC First Team Players including a personal message of your choice from the players. Liverpool FC 2018/19 Home Shirt signed by Liverpool FC First Team Manager Jürgen Klopp, including a written personal message from Jürgen. There are so many ways for your OLSC branch to take part in the Fundraising Challenge! We encourage you to get creative, bringing fellow Reds together to have fun and helping to raise vital funds for the Club’s official charity at the same time. Q. Can each OLSC enter more than one of the 5 Prize Draws? There is no limit to how many of the five draws an OLSC can enter, but each OLSC is limited to ONE Entry per draw. Entry into each LFC Prize Draw is solely dependent on whether the OLSC has raised the amount required for that specific level, as mentioned earlier. This same logic applies to all Fundraising Levels within the Challenge. If an OLSC raises an amount that falls within Level 2 – Team Players i.e. £300 GBP, then this OLSC receives automatic entry into both Level 1 & Level 2 Prize Draws. If an OLSC raises an amount that falls within Level 5 – The Boss i.e. £3000+ GBP, then this OLSC receives automatic entry into Level 1, 2, 3, 4 & 5 Prize Draws. This ensures that there is equal opportunity per OLSC per Fundraising Level for the chance to win an LFC Prize. The OLSC Fundraising Challenge 2018/19 starts on October 2nd 2018 and finishes on Sunday 12th May 2019 (last game of the season*). The OLSC Fundraising Challenge 2018/19 is open to Official Liverpool Supporters Club branches only. OLSC branches must register to take part. Registration is open throughout the 18/19 season. All fundraised monies must be transferred to the LFC Foundation no later than 30th May 2019 to be included in the branch total. Fundraising Challenge prizes will be fulfilled in the 2019/20 season. Fundraising Challenge rewards will be fulfilled once the competition closes and will be issued to qualifying branches no later than 31st July 2019. To download the PDF version of our Terms & Conditions + Fundraising Rewards Levels & Prizes information, click here.